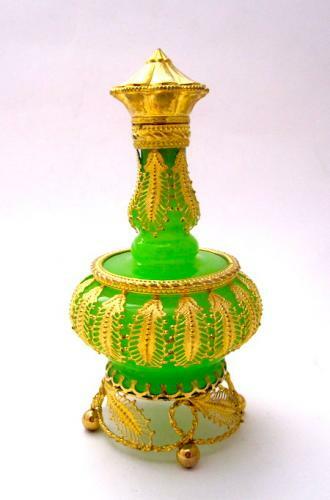 Antique Palais Royal French Green Opaline Glass Perfume Bottle with Fine Dore Bronze Mounts all on 4 ball Feet. The Body and Base Beautifully Decorated with Dore Bronze Feather Pattern. Stunning and Very Fine Dore Bronze Mounts.